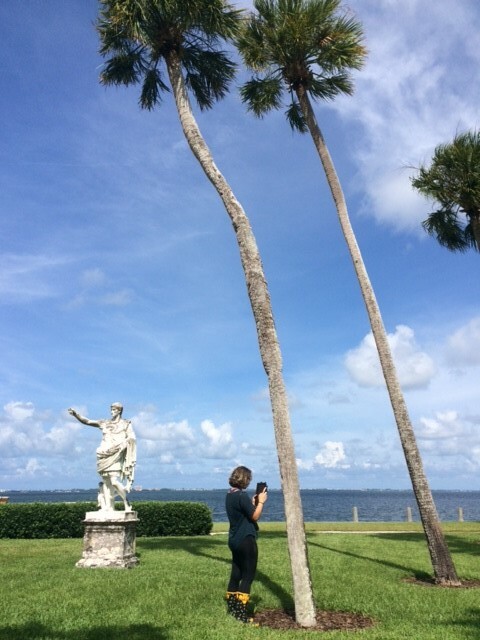 Even the Bayfront grounds and gardens are entering the digital age at The Ringling. TreeKeeper, a tree management software created by Davey Tree, is helping the Grounds and Gardens staff at The Ringling care for the hundreds of trees on the 66-acre campus and share the wealth of botanical knowledge with visitors and anyone with access to the internet. The first paid Grounds and Gardens Summer Intern, third-year New College student Sydney Clingo, continued the work of logging each individual tree on the museum campus into TreeKeeper. This is an immense task, so for Sydney’s internship, her mentor Karen Smith, curator of the Mable Ringling Rose Garden, decided to begin with all of the trees in an area drawn around the main walk from the Visitor’s Pavilion to Ca’ d’Zan. For each specimen she logs, Sydney takes a photo of the full tree, the bark, a twig, a leaf, and the tree’s acorns or flowers. She also measures the diameter, and uses a special tool called a clinometer to measure the height, and enters this data and the photos into TreeKeeper. “For our side,” Karen says as to how TreeKeeper will help the Grounds and Gardens staff, “It’s all about taking care of the tree and visitor safety.” As part of her internship, Sydney learned how to do an assessment of a tree for safety purposes, looking for overhanging branches, learning about the nutrition for the trees, and boring into the trunk for a sample to see the structure of the tree and measure its health. Sydney studies Agroecology, or sustainable farming, and she took this internship to learn how to identify plants. “Just taking pictures of the trees has helped me become more familiar with the flora and fauna around us. I can go back over to New College and say, that leaf looks like an oak leaf.” To record these new botanical discoveries, Sydney has created a book of pressed flowers and leaves with notes on the species. 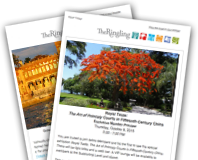 Currently, The Ringling is a level one arboretum (an area where trees are grown for education or scientific study). Karen says the goal is to become a level three arboretum, with the planting of more species, more labelling, and educational programs about the many native and exotic species. TreeKeeper is an invaluable tool to help the museum expand its arboreal offerings.